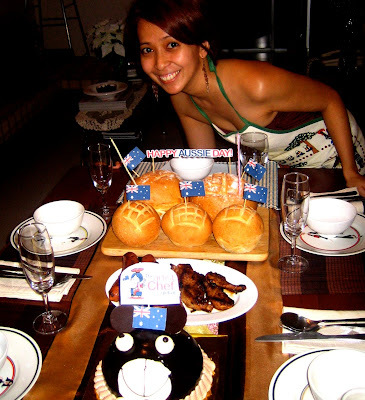 The Artist Chef: Aussie Day - Saigon Celebration! 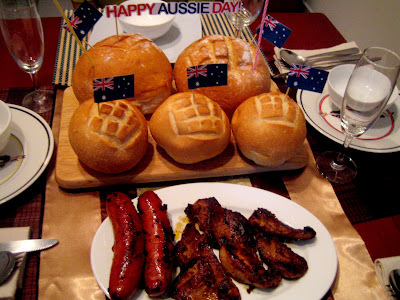 Aussie Day - Saigon Celebration! This is the Kangaroo like cake I bought in a French bakeshop here in Saigon called Tous Les Jours. The big and small bread bun for the English Onion soup I learned from my idol, Jamie Oliver. Of course the Fusilli Pesto, the sausages and pork are part of the dinner meal. I marinated the pork in Coopers stout beer and vanilla ice cream. I can say the tenderness of the porky is sooo awesome. Can't wait to do this recipe again. Since it's an impromptu celebration, I didn't cook much. Though what I cooked is still too much for me to eat it by myself. So I invited one friend. It increased unexpectedly into four. The night was indeed a good dinner and a simple way to celebrate Ozzie Day. Yay! 'Til next time me dear mates!!! 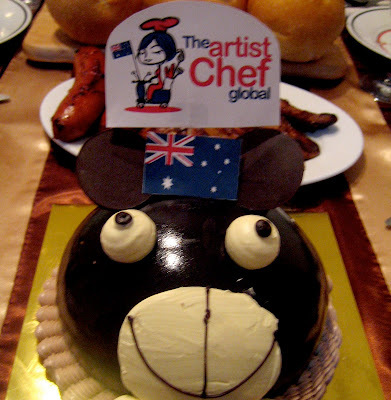 Artist Chef Kangaroo po ba yung cake? Parang teddy bear eh. Saigon na po pla kau. Kala ko po Australia na nadun kasi brother ko Cook. Happy belated Ausse Day! Nice theme you have.